I had no exposure or interest in art until my undergraduate years at Manchester University. I read a book about Picasso and this prompted a visit to the large retrospective at the Tate Gallery in 1961. I was drawn out of curiosity to the Manchester Whitworth Art Gallery and especially to the room containing recent purchases of contemporary British art. 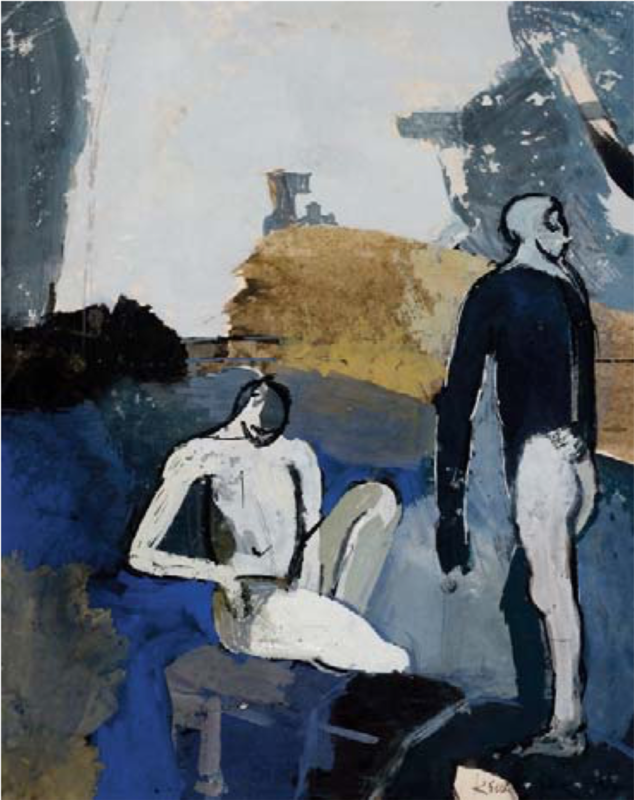 Among them was a Keith Vaughan gouache Blue Figures and Landscape that I loved without knowing anything about the artist. I also saw his large oil The Second Assembly of Figures on show at the City Art Gallery. I was fortunate to be introduced to Francis Hawcroft, keeper of the Whitworth, and asked him how I might make a purchase of Vaughan’s work. To my surprise Francis, who owned the large gouache Labourer with Hod, said he would write to Keith and arrange for me to visit if possible. I received a letter from Keith in his neat handwriting suggesting a meeting when next in London. By this time I had seen several small gouaches for sale – out of reach of my student means, and had also had the pleasure of seeing his Whitechapel exhibition in April 1962. A meeting with Keith was duly arranged for 4pm on April 16, 1962, but I was embarrassed to be three-quarters of an hour late, having got lost. No matter, he put me at my ease. I was taken to his ordered studio and given tea while I looked with amazement at several oils in progress. It was agreed that I could purchase a small gouache for £15. I was cautioned not to make this purchase price known. The market value was at least £50 in Bond Street. My appreciation of modern painting was embryonic and I must have mentioned some painters I had encountered. Prunella Clough, I remember, he particular liked. We soon got down to looking at pictures. He produced a folder of over a dozen. We laid them all out and, one by one, I narrowed them down until only two remained. The last to be put on one side was a charming work of a row of houses in Durham, I think that I have since seen it in Agnew’s. My final choice, of which he strongly approved, was Two Figures in a Landscape (c. 1956), and he signed it for me. It is still a treasured possession and illustrated in Keith Vaughan by Vann and Hastings, (fig. 174). I have always thought of it as a classic little Vaughan – with the perfect balance between figure and landscape and beautiful range of colour and texture. I remember him telling me that he worked on two or three at the time, some completed at one sitting, others laboured over and several, ultimately, rejected. I must have stayed about 45 minutes and left proudly, clutching my very first purchase of a work of art. Keith’s work has remained a firm favourite and I have added some six other works over the years and my interest lead me to meet other Vaughan enthusiasts, including John Ball in Sheffield and, later, in London, Canon Gwyllim Morgan and Alan Freer in Manchester.